Dining out in restaurants and hotels only became acceptable for women in the last decade of the 19th Century. Before this time respectable middle and upper class women did not eat out in public in male company unless they were travelling. 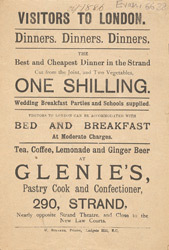 Men ate in dinning rooms and restaurants, eating meat, pies and fish whereas women could only eat in tea rooms and in cafes provided by large department stores and confectioners like the one featured in this leaflet. They were offered a very different menu, usually consisting of cakes or sandwiches.